Spending a great deal of time in Atlanta, I’ve come to grow a major affinity for Chicken n Waffles. A concept common in southern regions, but not so much in the northeast, specifically speaking NYC. Since moving to New York 4 years ago this October, I constantly ask friends, co workers and random people I encounter out and about, what are the best restaurants to try in the city. Being a huge foodie, me and my wife love to discover and be introduced to new and unique restaurants in the city. Which surprisingly, is a little more difficult than you would imagine for a city as big as New York. Often times the really great food is a bit harder to find as most aren’t really promoted too heavily on go to sites such as Yelp, Trip Adviser, etc. One style of comfort food that seems to be some what of a far fetched combination to a lot of New Yorker’s I’ve asked is Chicken n Waffles, which my immediate reply is “WHAT?? YOU’VE NEVER TRIED IT? (yes shouting like that lol)” And the most common reply is “why would you put those two together, that’s literally two separate meals (breakfast and dinner). I guess living in Atlanta for over 13 years spoiled me in this sense as there are so many restaurants that offer it. With that being said, more and more restaurants here in New York are becoming more welcoming to this savory combination with New York probably being the mecca of transplants, you have so many different palates to please. And just recently my wife found a gem to say the least, SWEET CHICK NYC. Founded by John Seymour, a Manhattan native that grew up working along side his father in an Irish Pub, working his way up the restaurant chain as a busser, server and bartender. 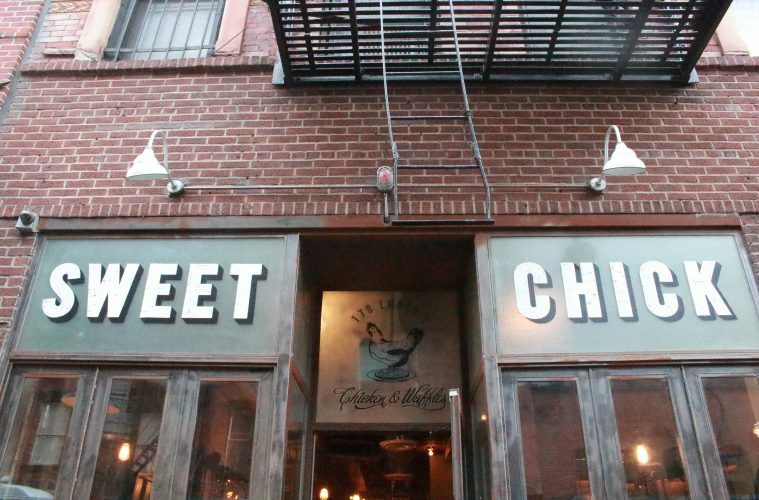 John opened up Sweet Chick in 2013 with his partner Sam Saleh. Their first location was on 164 Bedford Ave in Brooklyn and with the success of that location they later opened a second location at 178 Ludlow St in lower Manhattan. We have quickly become somewhat regulars. We’ve probably been at least 5 times in the last month and a half, a good amount with us staying on the upper east side of New York. 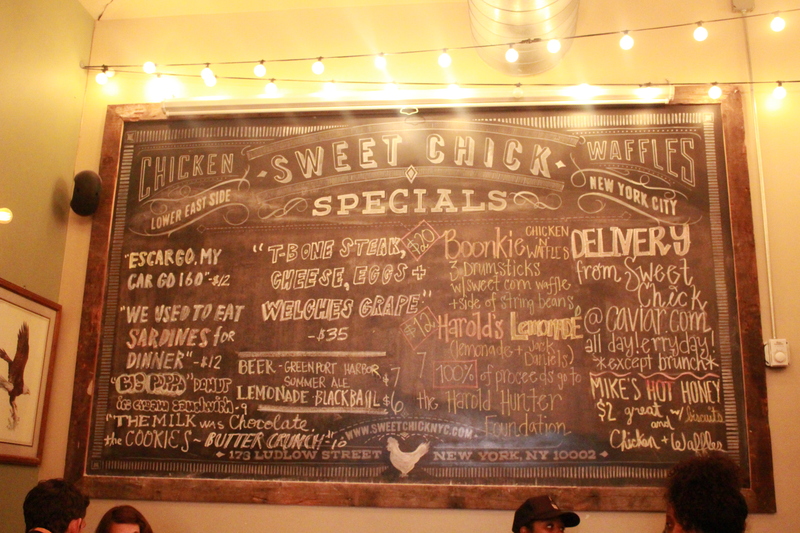 Sweet chick is a great restaurant space with a ton of character and we just enjoy ourselves every time we go. A great mixture of people from all walks of life, but the coolest part is that all of the customers are super fly in their own way. You have business men and women mixed with hipsters, socialites, you name it. 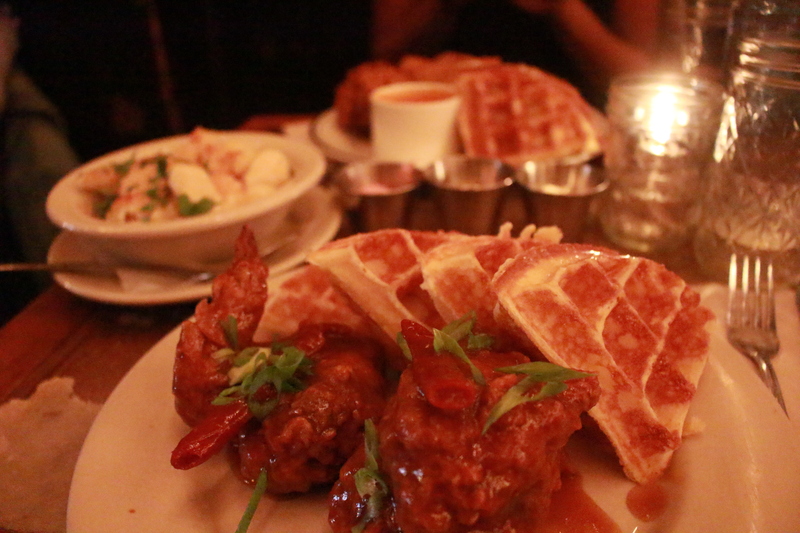 And the best part is the FOOD, in particular the chicken n waffles, our favorite. I am always one to try new items on the menu but I am totally stuck on the General Tso’s Chicken with the Milk Jam Waffle ($18). One word…….AMAZING! The chicken is so crispy and tossed in a Tso sauce and the milk waffle is extremely moist (everytime) and served with a trio of butters (lemon butter is the BEST). 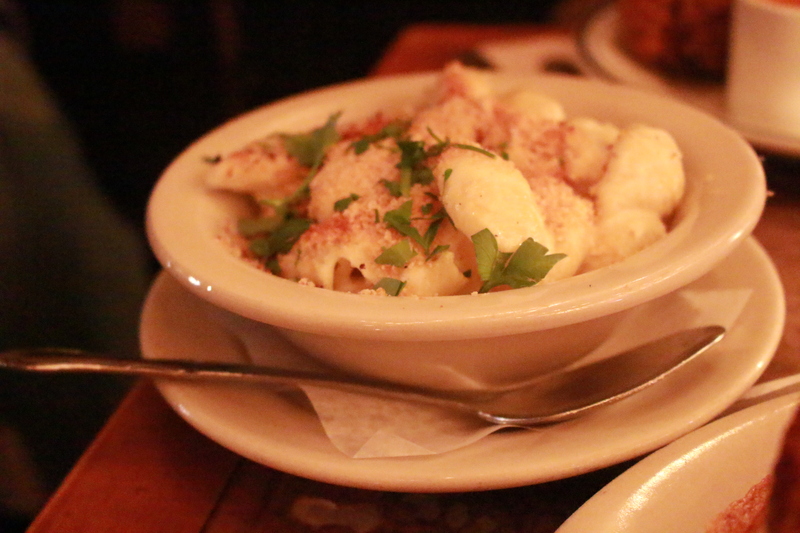 But you can’t stop there, now for the sides we always get the mac and cheese, which is perfect to balance out the sweetness of the waffle and somewhat spiciness of the tso sauce with this creamy goodness. I literally enjoy every single bite each time I eat here. I often joke that I can’t wait for people to visit us to give us an excuse to keep going back. If you are big on cocktails, no worries….The Chick has you on that end as well! They have a great selection of signature cocktails on the menu such as the self titled ‘The Sweet Chick’ as well as beers. 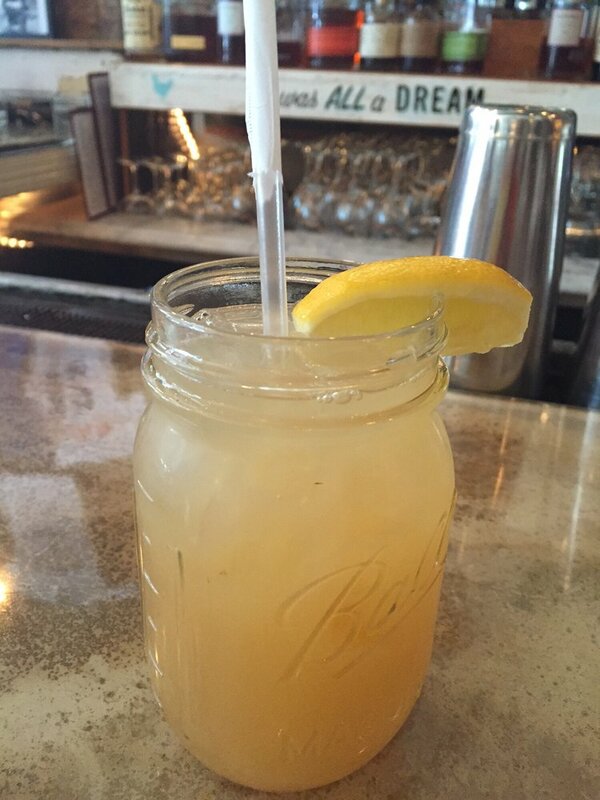 My personal favorite to put that finishing touch on my meal is the ‘Harolds Lemonade!’ Very simple but that sweet taste of lemonade mixed with great tasting bourbon really takes my palate to the next level. This looks amazing. Me and my husband will definitely have to try this place out. We are both huge chicken and waffles fans.